It was Mother’s Day at the in-laws house. I was on their dock fishing for a good two hours with no luck. Most of the in-laws were there as spectators though some were also criticizers. For example, my farther in law finally wisecracked, “Well Brad, since you’re not having luck catching any large fish, we have some bread in the house you can use to catch the little fish." Very shortly after he popped off with that statement, the monster 24” bass I’m holding hammered my swim bait, gulped it down and the fight was on. I won. After all the commotion was over and all had a chance to admire my personal best largemouth bass she was released back into the water. Needless to say, I wore a smirk on my face like the grin on a fox just leaving a hen house for the rest of the evening. It was a badge of honor. 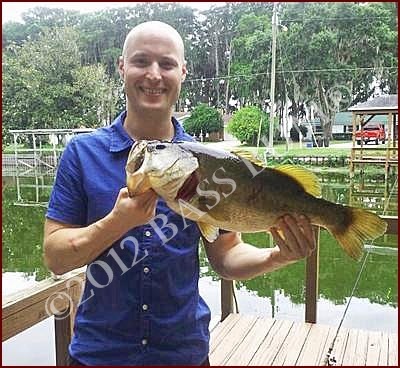 Unfortunately, no weight was recorded but at 24” the estimated weight, per bass relative weight charts, could reasonably be 8 to 8 ½ pounds.